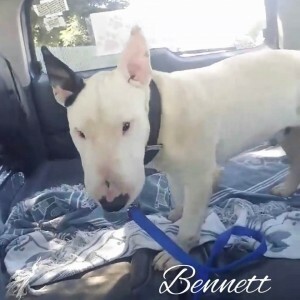 Bennett – Sebastopol, CA – Available Soon | Bull Terrier Rescue, Inc.
Bennett is a laidback fellow who is recovering from pneumonia. He’ll be neutered once he’s fully recovered and evaluated. Bennett is about 3 to 4 years old and 45lbs. If your information is not yet on file, please complete our online application (http://www.bullterrierrescue.org/?page_id=572). Please contact Suz at suz@bullyhaven.org or 415-672-7391 if you have any questions about this sweet guy. This entry was posted in Available Dogs, Available Males by Susi Ming. Bookmark the permalink.